Our first kit was a delightful pink colour and was used up until 1909. 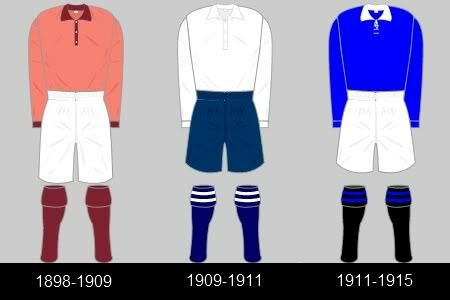 It was then changed to a white and blue number and in 1911, when the new club was set up as a new business after the old one folded, it was changed to the now more familiar blue shirts. Not a great deal of change in these years. The stripes on the socks the most noticable. The collar and the addition of the badge the only others over the ten years. 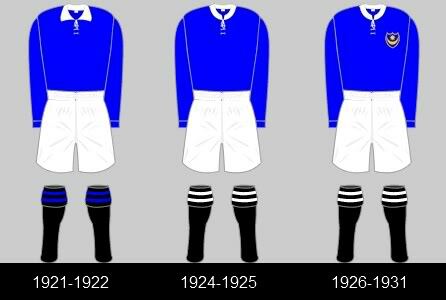 HistoricalKits.co.uk has a break in shirts between 1931-1936, the only shirt i can find for that period so far is the kit worn against Man City in the 1934 FA Cup Final, I assume this was the away kit at the time as Man City also wore their change shirts. 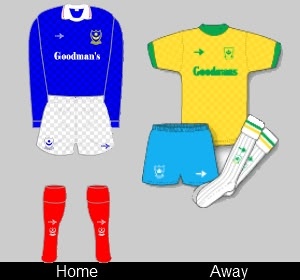 The old rules stated that if a colour clash occurs, both teams change kit. Again, not a massive change. The stripes on the socks made way for a solid white top. The collar and badges were the other slight changes. 1939 saw us lift the FA Cup and the infamous ‘Who held the FA cup the longest?’ question came into being! 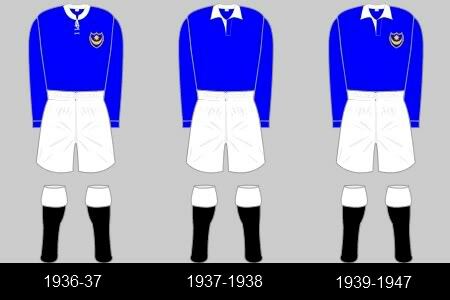 Not many games were played in the 8yrs the last shirt was in use as the out break of the Second World War put a stop to all fixtures. The 70′s brough on a couple of changes before going back to the classic blue/white/red combo. 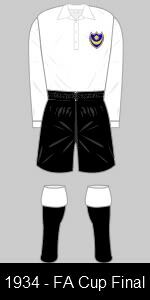 The club offered up the descision for the following seasons kit to the public in the early 70′s and as a result the white kit was introduced as the new home shirts. This was dropped after 3 seasons as it saw the club free fall down a few divisions. This Gola number was supported with an identical designed red away shirt and white third shirt. This is a nice effort from Le Coq Sportif. The actual away shirt isnt as hard on the eye in real life as it appears in this image. 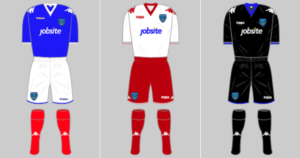 There was a nice third shirt worn in these years, a red version of the home shirt, with red shorts and the red home socks. Umbro were next up and came up with my favourite shirts. The away shirt is now available as a Toffs repro. If I’m beeing picky I’d say the Umbro logo should be on the sleeve of the away shirt and not on the chest. The club badge was either central (as pictured) or to the right as you look at the shirt. Not sure why they chose to mix it up? An all red third shirt was also used during this time. Another manufacturer change. Scoreline this time. The checks are a little more subtle ‘in real life’. Not a bad kit and the away shirt was a very summery yellow and green number…just like watching Brazil, but colder. The image here gives a checkered shaddowing on the away shirt, the shirt have is just plain yellow. Suprisingly, another kit maker lined up to take this on. Stand out kit for most fans as it was worn in the splendid FA Cup run. 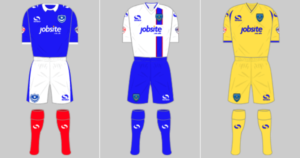 For that they had shorts that matched the shirts and blue socks, something that was copied in the 2008 FA Cup run. The away shirt was the same design only red. Another supplier change anyone? Asics take the batton for the 93-95 season. The away shirts were red and black halves for a season and white with thin blue stripes for the next. So a kit change without changing makes! Fratton Park gets a mention on the sleves and the sponsor changes to the local rag, The News. The away kit was the same white one as the previous season for the first year and red and black stripes for the following season. Well Asics’ 4 year run comes to and end and Admiral make a welcome return. 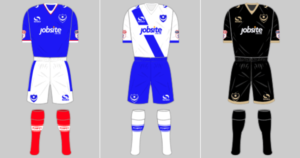 Nice kit this, with small star and crescents running through the material and an unsublte ‘Pompey’ across the lower back. The Away kit was a nice yellow versin with a large star and crescent on each shoulder. 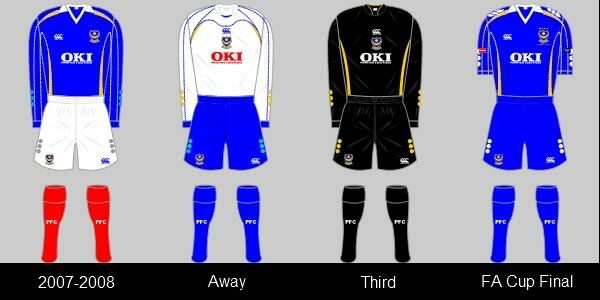 1998 saw the centenary of the club and a new away shirt underwealmingly celebrated it with a small tag on the back. The actual shirt was nice, white with blue shoulders. 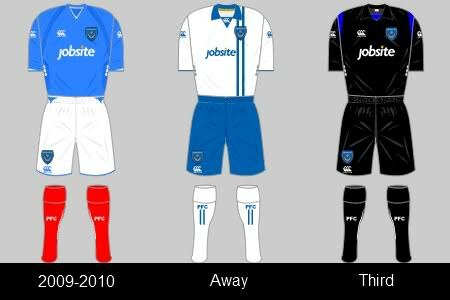 The club opt for Jako as the next manufacture, though fairly last minute, some kit could be brought from the shop that had Pompey Sport logos covered with Jako badges. The back of this shirt had an Arsenal-esq back to it so the shirt was blue with a white area for the players name. The away shirt was the same design but mainly red with a ‘goldy’ trim. Strangely a thrid kit was released. Not sure we played any one who wore blue and red that season*. Jakos first propper effort, not bad. The away kit is the reverse of the home and the third kit was a plain black affair with yellow piping. 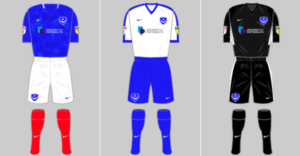 Rugby specialists Canterbury moved into football this year with Portsmouth, the special shirts having ion-x technology to aid performance. It must have worked as we won the FA Cup. Half way through this year the canterbury logos appeared on the shoulders of the players shirts. The only replica shirts to have them were the FA Cup Final shirts released before the Webmbley win. 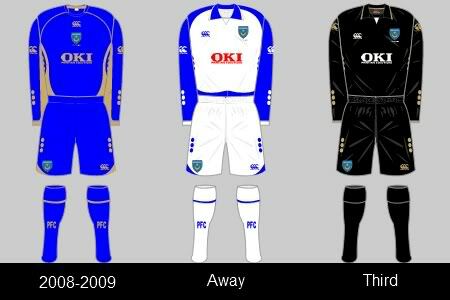 The cup run also saw us adopting an all blue affair as it was deemed ‘lucky’. 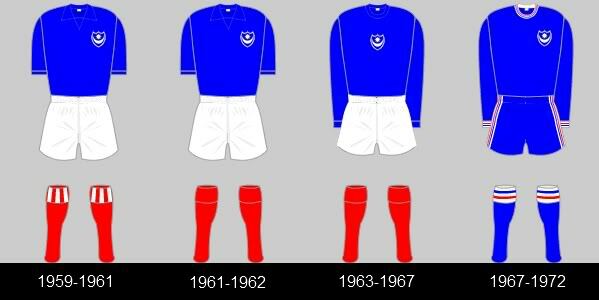 A contriversial all blue affair come out to celebrate 110 years of Portsmouth FC. The gold was also added as the 2nd colour of the home shirts. The white away kit was only worn once during the 2008/09 season, the opener against Chelsea on 17th August. 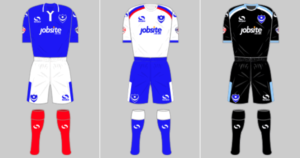 It only had 2 league outings, the first was in the last game of the 2007/08 season when it was previewed against Fulham at Fratton Park. 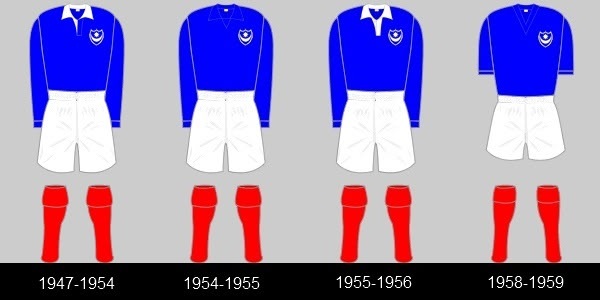 The Rememberance Weekend game for Portsmouth used the black third shirt and had the Poppy in the centre of the chest. For the FA Cup Semi Final the club released a special one-off shirt. Due to Canterbury going out of business during the season, a new manufacturer has been lined up for the 2010/11 season. Kappa signed up for 5 years and the club are allowed to use a sample it from them for the game on 11th April. They will announce the new kits in the summer but I guess a new kit will be used on the last game of this season. 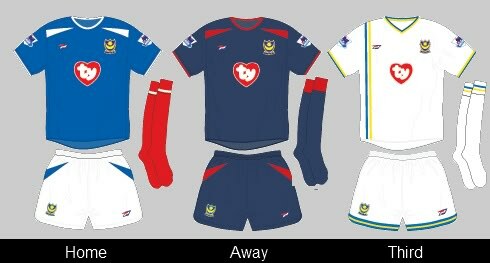 Last seasons trips to Wembley showcased this years kits. 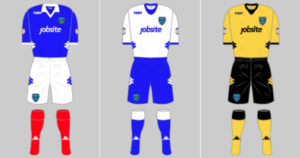 The Home shirt is the same as the one worn in the Semi v Tottenham (except the gold logos on the sleeve are now white) and the away shirt is the exact copy of the final kit The third shirt follows the same simple design but in black with blue trim. No pink keepers kit this year but a return to traditional all green or all yellow. The Poppy Day Appeal shirts this year were the home shirts with the Poppy above the Kappa logo. For Marie Curie week the Marie Curie logo was underneath the Kappa logo for the home gain against Sunderland. The Royal Navy charity had their logo on the back of the shorts for some games, see here. This year was the first year we had sponsors on the back of the shirts. The clubs new owners had their own logo (Powerplay Golf) on the back of the shirts above the players names in some games. With Jobsites 3 year contract up we expect a new kit. So far no news of that. Rumours of an orange away kit similar to Fulham have been heard and release dates of November also banded around we are still no clearer. Our first pre season friendly was due today but was cancelled, would have been interesting to see what we wore. I have asked the club but no response yet. 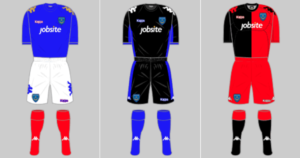 Now we have successfully fielded a ‘team against Gibraltar, Brighton, Bolton, Wimbledon and Salisbury we can see that the kit room dusted off the 2010-11 kits. 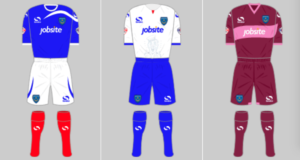 The White/Burgundy kits for the Spanish tour, and the blue home kit against Bolton and Salisbury. Still no word about next seasons kits. First away game tonight and the orange is confirmed. Not as orange as the Bishops Printer days but not as washed out as the promotion campain third shirt. Comes with black shorts and socks matching the shirts. The first outing for Sondico and the first for the fan owned period. The home shirts have a ‘wave’ across the shoulder as a tip of the hat to our sea connections. 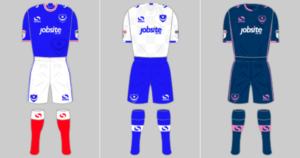 The away kit has the Pompey Sailor logo watermarked on the front. 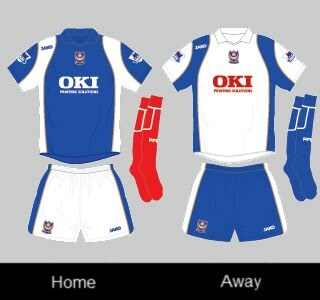 The third kit harks back to the clubs original colours. The home kits this year are a commemorative shirt. As the the centenary of WWI comes round the club have put the names of the Pompey Pals through the stitching and the crest is a replica from the 1914 season. The away kit is another retro affair, taking the single vertical stripe from the 70’s. The third kit goes back to a proper yellow. Another collared home shirt, this time a little more chunky with no need to buttons. Standard white away shirt and the ever popular black third completes the season line up. The old style crest is now across all three kits. A fan vote resulted in these three choices. The away kit has a retro feel to it. The shirts have 1898 in the ‘v’ on the neck. Another fan vote. The home shirt is a throwback to the 1960’s kits. The away has a very light grey checkered pattern and the third sees purple being used for the first time. The kits were revealed slowly with close up details shared on social media as teasers. Though as there was a vote it was easy to spot which ones had won. New kit, new sponsor. Nike’s first outing is the Challenger II template. Has a nice camo shadow. The new sponsorship deal with Portsmouth Uni was apparently not the biggest bucks on the table, but the Eisner family wanted to promote higher education in the city.